Are you living in North Carolina and looking to get cash for structured settlement payments rights that you want to sell? Review the law requirements specific to North Carolina in addition to what is required also in most other states when considering to sell your structured settlement payments from an auto accident, medical malpractice, and the like. Here is some information that may be of interest in case you want to sell and get cash for structured settlement payments in NC. There have been reports online about the North Carolina law forbidding the sale of a structured settlement, but it isn't true. 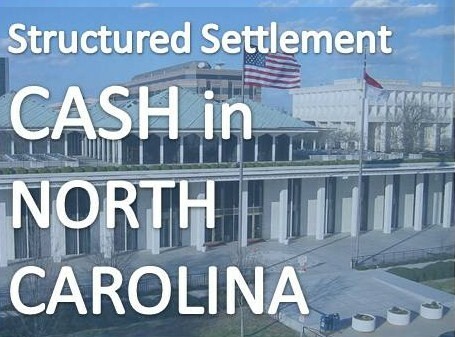 According to that report, many people in NC have been "prevented from selling their structured settlement payments" because of the recent legislation to limit the discounting rate that is applied to the settlement sale. The North California Structured Settlement Protection Act (1999-367, s. 1.) § 1-543.12. (6) (current at the time of this writing, to the best of my knowledge) includes a provision that is different from most other states imposing a ceiling to the allowed discounting rate that should not exceed an annual percentage rate of "prime plus five percentage points..."
What this means is that the interest rate that is applied by a structured settlement buyer to the lump sum (the higher the rate, the more profits for the buyer, the less money for you, the seller) should not be higher than the basic, or the prime rate, that is determined by the Federal Reserve, in the first Monday proceeding the month of the sale that is taking place, plus an additional rate of no more than 5% that may be added on top of this by the buyer. The prime rate is an interest rate determined by individual banks. It is often used as a reference rate (also called the base rate) for many types of loans, including loans to small businesses and credit card loans. As an example, the prime interest rate at the time of this rating is 3.25, as you can see here. If a structured settlement buyer were to assign a discounting rate to a payments buyout today, the maximum interest rate he would be allowed to apply according to the North Carolina structured settlement transfer law would be no more than the prime rate of 3.25 plus 5% = 8% altogether. What is the implication of this law to a North Carolina structured settlement seller or buyer? Naturally, the law plays rather into the hands of the seller, thus s/he'll get a higher lump sum in cash for structured settlement payments. Simultanousely, it reduced the profit margin of the structured settlement buyer. Consequently, it follows that this legal requirement to NC residents would rather encourage payees to sell future payments since there's more money in for them, while it would limit the enthusiasm of buyers to purchase settlement payments. It certainly does not imply, in my humble opinion, a prohibition on structured settlement sales by the NC legislature. That would be highly misleading. The North Carolina law aims rather as protecting the interests of sellers who want to get cash for structured settlement payments against being exploited by factoring companies inflating the interest rates on structured settlements. As always, the transfer must be fair and reasonable and in the best interest of the annuitant and his/her dependents. § 1-543.15. of the North Carolina Protection Act indicates that the provisions of the act may not be waved, and in case of failure on behalf of a structured settlement buyer to comply with the law, the payee may bring an action against the buyer to recover either for monetary lose or fro damage up to $5,000, or both, against the transferee. Are you a residence of North Carolina and have a story in relation to getting cash for structured settlement payment rights? I would like to hear from you! Please share your story (and upload your photos) below.